An American pollster number-sifts to zero in on some interesting trends. Popular wisdom tells us that in a ‘flat world’, people everywhere are more similar in their aspirations and behaviour than ever before. Products are launched simultaneously around the world; thanks to the internet and satellite TV, the same news can be delivered and consumed anywhere in the world; movies, books, music, issues, concerns, fears spread with similar ease. Yet, the world, Microtrends tells us, is getting fragmented. Within the same country, city, or even neighbourhood or across countries, some people are very different from others. Some of the microtrends that Penn and Kinney Zalesne point out are fascinating, some others are worrying, and yet others just bizarre. For example, the number of ‘Cougars’ (a term used to describe older women dating younger men) in the US seems to have doubled between 1997 and 2003 to three million couples. In the UK, there are one million couples that are LAT couples. That is, these are monogamous couples who live in the same city but don’t live under the same roof (“live apart together”, or whatever that means). More scarily, a 2004 study of 400 global terrorists shows that three-fourths of them came from upper or middle class families. 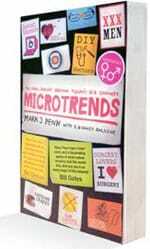 The point to note is that since microtrends by their very definition are small, there are larger and counter trends under way as well. As Penn writes, “for every group of Gadget Geeks, there are people who say turn the technology off. Americans are dieting more than ever, but the steak houses have never been (fuller).” His argument: while there are others who say America is moving in a couple of big directions, he sees the country moving in “hundreds of small directions. At once. Quickly.” These microtrends have important consequences for marketers and policymakers; new products and services (therefore, new opportunities) will be needed to cater to these minority groups; and policymakers will have to come up with new policies to deal with new social situations. Perhaps Penn, who coined the term Soccer Moms, could have refrained from dropping names as often as he does in the book (on second thoughts, he does head a PR firm, doesn’t he?) and generalising (writing on the rise of Indian women, Penn makes sati look like an India-wide custom, which it was not), but there’s no doubt that Microtrends is fascinating. It’s a book you should be carrying on your next long haul.